Your chinchilla will be happiest if let out of its cage every evening and allowed to run around in a room. However, because they like to chew on things like furniture and wires, you need to cover these things to protect them and your chinchillas. Baseboards and other wooden furnishings are prime targets for chewing. You can try out a special spray that tastes bad to chinchillas. This spray is colorless and odorless so it in theory won't bother humans. Be warned that we haven't had much success with this spray, but it is still worth a try. Chinchillas will also chew on wires including cable, electrical, stereo, and phone lines. The best thing to do is to remove these wires from their play area. If that isn't possible, put the wires in cardboard boxes or wrap them in rubber tubing that has been split down the middle. We do both depending on the location of the wire. If there are windows in the room, find a way to block the ledges. Chinchillas can jump pretty high and may be able to reach the window ledges where they'll most certainly find something unprotected to chew on. We use window blinds that we keep in the down position to block the ledges. With window blinds, the thing to watch out for is the draw string which if left close to the ground will be chewed. Our chinchillas are in a room with a door. However, we like to keep the door open so we can see them as we walk by. This of course is a safety hazard since they're more than happy to run out of the room. To prevent this, we've assembled a screen that covers the doorway. We can see them, they can see us, and we don't have to constantly open the door. If you use the bathroom as your chinchilla play area, make sure the toilet lid is closed. It's best to let your chinchillas run in low-traffic areas. They are unlikely to survive being stepped on. We prefer to sit on the floor when interacting with them. Keep other pets away from your chinchillas especially dogs and cats. Some people have had success with getting all of their pets to get along, but until you have evidence that your pets will behave, play it safe. 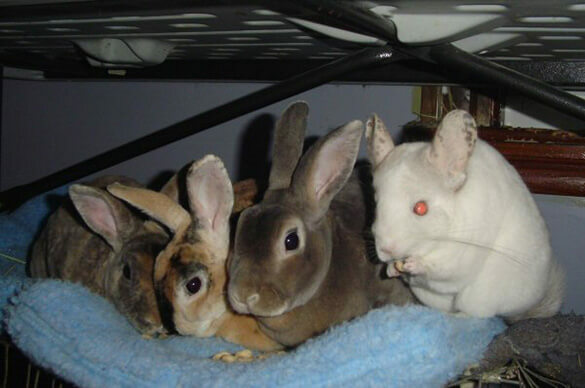 Some animals that are likely to be compatible include guinea pigs and rabbits. Inspect your home for small openings that chinchillas can fit through. It is best to assume that they can fit through just about any hole. This includes fire places and openings behind stoves, bookcases, and refrigerators. So I've got a chinchilla named Milenko. I love my lil fooftater and he seems really happy when I let him run and play. My only problem is he pulls wood from the trailer wall and tries eating it. I stop him before he can. (He chews from the wall while on my bed) I'm getting some stuff to wrap around the wires so he can't chew them but for my walls I was planning on using "Fooey Ultra-bitter Training spray" and dousing the walls and doors. My question is is it safe for chins or is there another route i can take? I don't have much money so I need a way to prevent him from chewing my walls. Please help. if she throughly can do that the possible way is by jumping on a platform that is around 60 cm (24 inches) tall so I wondered if chins can jump that high. Please help!!! Thanks!!!! I am making ledges for my chinchilla, i know you are supposed to use kiln dried pine wood, i only have pine wood at the moment, my question is if i put fleece covers on the pine wood is it still unsafe for my chinchilla? Honestly, I'm 22, I've had a dog that was fully mine, paid for vet and food etc, walked every day, whole 9 yards. That was way easier than a chinchilla. You should wait until you are out of high school and maybe have your own place. They are MESSY and they bond with one person. If they don't get to play enough they will die much sooner. They also live 20 years. That's a big commitment and if you're not willing to make the sacrifices that entire 20 years don't do it because changing homes to late in life can break their heart and they will probably have a shorter life also. =D thank you so much my parents just made the decision that i can get my first chin and they said i can cuz i learned how to chinchilla-proof!!!!!!!!!!!!!!!! My chinchilla can't seem to get along with my rabbit or my guinea pig.How can I make him get along? There's no way to force them to get along, try putting them in the same play area but make sure there's plenty of space so they aren't right next to each other. Unfortunately with chinchillas if they don't like another animal they more than likely will NEVER like it. My chin loves my dogs and cats as strange as that is and has even cuddled up and ran around with them, however when I got another chinchilla she would attack her and do everything she could to get her away. I ended up having to get rid of the other chinchilla because of this. So if you chin doesn't like the animals dont stress it out by trying to associate it with the others! Not sure if this would help or not but, My chinchillas were very curious and nibbled on the screen door a little once we got it installed. After I saw that they would nibble on it, I built almost like a fence out of card board and put it in front of the door like a barrier. They eventually learned that they could not go past that point, my boyfriend also bought the chinchillas more chew toys to keep them occupied. Hope this helped!!! I couldnt really find a section for this, but my chinchilla is very devious and loves to "run" from me. The moment i leave him alone he demands my attention by scurring over my hands and he WANTS my husband and I to chase him! We have the whole living room blocked off and its the funniest cycle, walking after him and then sitting on the couch and him running over me and teasing me. Whatta goober. Not sure if this will help or not but our older chin runs from my husband when we let him out of the cage. It used to take hours to catch him, but we have found that if we sit the bath house on the floor he will just climb in it and we can pick it up and sit it (with him inside) back into the cage. we also got them a play pen but they jump out of it. we dont mind them running around in the room but we have baseboards that they chew on and my mum doesnt like that. how do we stop them chewing on the baseboards??? I wonder if you could install special baseboards (on top of the ones that are there) which the chinchillas could happily chew on? Sort of like a sacrificial baseboard, wood trim, etc? Chins are not "trainable" and rather than have the destruction of expensive baseboards this could be a relatively easy solution that would not cost a lot. Has anyone done this already? The more I think about me comment above the more reasonable it seems. The sacrificial baseboard could be cheap and easy to replace as it got chewed up. Chinstrap really demolished the baseboards in his room... This way a chinchilla could play safely without worry of baseboard loss. We use cardboard to cover the baseboards.. we use painters tape to hold the top up. No chewing. If the room is just for the chinchillas and you don't care about looks, you can get pieces of cardboard to put over the baseboards, or I know that some people have covered or replaced their base boards with pieces of 2x6. Chinchillas will chew on just about anything. Tape will not stop them and could actually be harmful. The best thing to do is cover the wires with something durable like wood. However, even the tiniest exposed wire will be found and chewed on. We've learned this from experience. The chinchilla probably wouldn't slip out if the gaps between the cage wires is at least 1-inch wide. I would say that would be the bare minimum in case he might hurt himself sticking his head out. Otherwise, 3-4cm to 1/2 would be ideal. okay im getting a chinchilla and i have been none to be "careless" and i do not want to lose my chinchilla no matter what and i no i should buy a cage with out plastic wiring buy what if the chinchilla will slip out of it or something and i cant find him / her what should i do??? You can certainly cover everything with wood. Just make sure nothing can fall or slip on your chinchilla. No matter how closely you watch, eventually your chinchilla will chew on something if not protected. They love chewing! I'm going to get a chinchilla soon so I want to be ready. Can I cover all of my walls and stuff with wooden pieces? I would, of course, watch it the whole time and have other chewing things there to keep it busy so it wouldn't chew the wooden walls.